Here in the north, winter time provides a chance to assess the previous season, take a “deep breath,” and to plan for the following year. For facility managers, administrators, and volunteer board members now is the time to designate improvements which must be made to your facility. Planning your field renovation projects months ahead of time will streamline the process and ensure you receive the best possible product. Some projects are required annually, and are easy to plan for – spring aerification on a football-specific field, for example. Larger projects such as total renovation of a baseball infield occur less frequently but should be anticipated every few seasons. Wet field conditions: Many believe that an infield can be worked on as soon as the snow melts. Unfortunately, this is a false sign of spring with regard to field renovations. Sports fields should not be worked on (or walked on!) until all the frost has thawed. Even once the deep frost is gone, the ground surface may freeze over cold nights and thaw out under the strong April sun, only to freeze again the following evening. These freeze-thaw cycles make the ground very soft during daytime hours, so equipment such as laser-grading tractors, utility carts, and topdressers cannot be driven on the infield without getting stuck (Fig. 1). Trucks hauling material onto the field will either sink or leave damaging ruts behind. Figure 1: Wet field conditions often delay spring infield work, even once the ground has thawed, Equipment cannot be driven on the field without making a mess of the surface. 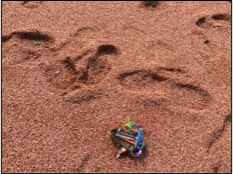 If the field is not firm enough to walk on, it should not be played on and certainly cannot be tiled and laser graded. Rushed timelines: The spring baseball and softball seasons are extremely short in Wisconsin. High school and college seasons are jammed into less than two months. Because the project must be crammed between field usages, the work tends to be rushed and of lesser quality than that done during a down period on the field. With games and practices occurring almost daily it is impossible to renovate an infield and allow ample time for the soil to settle before play resumes. After a field is tilled and re-graded, the soil tends to be quite loose until a few wetting and drying cycles have occurred to “firm it up.” Playing on a freshly graded infield skin can quickly create low spots in the high-traffic portions of the field, compromising the newly established grade. Soil production: Soil suppliers also battle wet conditions in the spring. In order to shred and blend products such as infield mix (Fig. 2), the suppliers must first harvest the raw materials from a field or a large outdoor stockpile. 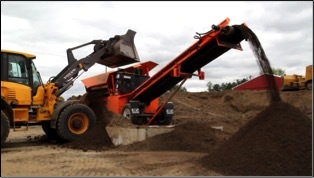 When the raw soil is in a sticky, plastic condition, no production can occur because the material will not flow through pulverizing and screening equipment. So even when the conditions at your facility are acceptable for earthmoving, if material suppliers are out of commission the project must be delayed. During the summer and fall, warm temperatures allow for quick evaporation and a speedy return to production after rain. In addition, some suppliers are able to get ahead of demand and maintain covered stockpiles as an insurance policy. Figure 2: Weather conditions must be dry for soil suppliers to handle, screen, and blend materials. Although finished stockpiles can be covered it is usually impractical to keep the raw components shielded from the elements. Sod availability: Like soil suppliers, sod growers are subject to Mother Nature’s authority. In order to harvest rolls of turf the ground must be firm enough to support heavy equipment (Fig. 3). In Wisconsin this typically occurs in early May. Level fields are intentionally chosen for sod production but certainly are not graded with the precision of a sports field, so drainage can be somewhat slower. 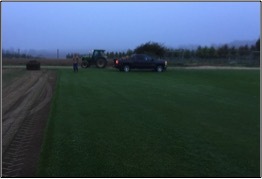 Fall is the best time of year to harvest and install sod. The ground is firm and the weather is very favorable for cool-season turf grasses, so the new sod will quickly take root. Figure 3: Sod production fields must be dry to support the weight of harvesting equipment and delivery trucks. Field renovation projects can still be completed in the springtime – but summer and autumn are the ideal windows for laser grading and other extensive work on your baseball and softball fields. We encourage our clients to plan ahead and book services for the summer and fall months now as our schedule tends to fill up quickly once spring hits. We hope this winter you catch some needed rest and find the time to plan for another successful season!